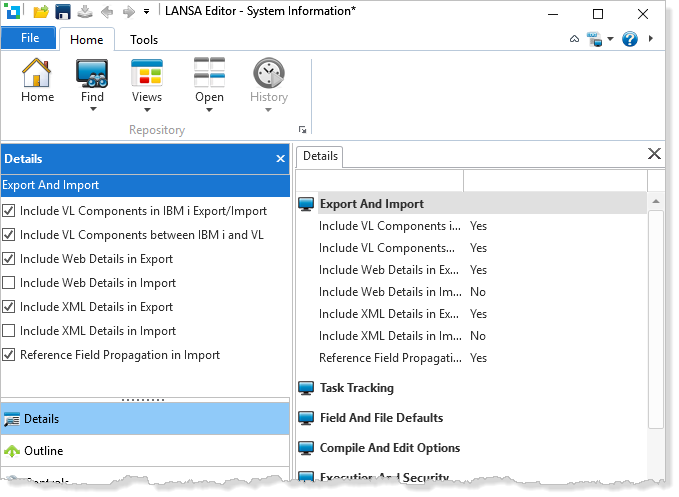 Controls how Visual LANSA component-related information is exported and imported between LANSA for the IBM i systems. Allows Visual LANSA component-related information to be transferred between a LANSA for i system and Visual LANSA systems. The option affects the Export, Check out and Check in functions. Allows the export of all Web details. This includes Web components as well as web details associated with fields, functions and system variables. Allows the import of all Web details. This includes Web components as well as web details associated with fields, functions and system variables. Allows the export of all XML details. This includes XML components as well as XML details associated with fields, functions and system variables. Allows the import of all XML details. This includes XML components as well as XML details associated with fields, functions and system variables. If set to No, when an Import executes, Reference Field characteristics are not propagated to fields that reference those Reference Fields. If a Reference Field is changed subsequently, the changes are propagated to the fields that reference it, as usual. Note : *IMPREFFLDNOPROP is also used by the Host Monitor and LANSA Import to decide if reference field changes should be propagated. Prior to V9.1 no updates were performed during these operations and "no update" is the initial default setting. This option now offers the choice of propagating changes or not. The use of this option is not recommended as fields may become out of sync with their nominated reference field and therefore it should be removed from DC@OSVEROP and set to 'N' in Visual LANSA. When this option is set to Yes, the input and output attributes to a field which references another field are not protected. This was was the default before V9.1. It should be remembered that when a field which is referenced by other fields is changed using the field maintenance options or the PUT_FIELD Built-In Function, all the referencing fields are also updated.